According to a recent Glassdoor survey, close to 40% of employees felt they were underpaid at work for the duties they performed on the job. While they “believe” they were underpaid, how do they know if they truly are? While it could have been a challenge before the Internet, but now it’s really not as hard as you think. If you really want to know if you’re being underpaid for your job duties or you are paid minimum wage for your overworking, here are ten ways to find out. 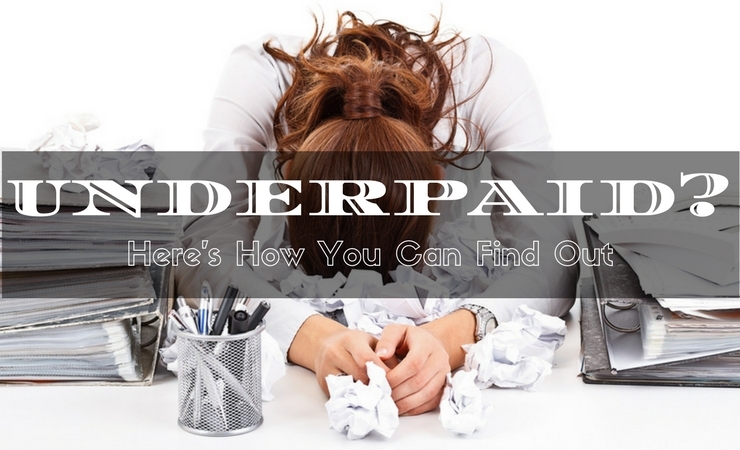 Underpaid at work – How to Handle? The following mentioned are few tips to manage things like ‘underpaid at work what are my rights’ and how to deal with underpayment of wages. Go to your favourite job listing website and look for closely related job postings. Be sure to pay close attention to the role, how much experience you need and the location of the job. If you can, try to limit your job search to within 25 miles of your current job because geographical locations can affect the salary. Inside these job postings, try to find the companies that list the salary and benefits, and compare it to yours. If it’s well below the norms, you may want to consider either renegotiating or leaving for another company. The Internet has so many great salary research-based websites such as Glassdoor and Indeed. If you work with a larger corporation, it can be very easy to see what other people are being paid; however, if you work with a firm with less than 50 people, it can be a bit tricky. Even if you work with a smaller company, try to compare your salary with a few companies in your area. For example, if you were a software engineer with a mom and pop company, what are the Fortune 5000 companies in your area paying its software engineers? Try to stay on top of this because salaries can change quite often. Don’t forget to factor in your experience, education and job duties. Just because the title says “software engineer,” it doesn’t mean the person is doing the same exact job as you. While some colleagues won’t open up about what they are being paid, some may be willing to share the information. Keep in mind, you don’t have to strictly talk to those who are employed by your company; instead, consider other avenues such as networking events and even Facebook groups. If you find some people who are working roles similar to yours, see if their pay matches up. If it doesn’t or even makes your jaw drop, you may want to assume you’re being underpaid. Some fields right now are in great demand, and companies are willing to do what it takes to draw in new talent. This begs the question: Do you work in an industry that’s growing or declining? If you’re working at a position that’s becoming automated, you may want to factor this in when looking at why your salary may be too low or not growing at all. To see if your position is in demand, BLS.gov offers the Occupational Outlook Handbook which predicts future growth. Most experts will warn you if you haven’t received a raise or had an annual review, it could be safe to say you’re being underpaid at work. If this is the case, talk with your employer to see why you haven’t received a performance review. A reputable company will always review you annually, and if anything, you should see a salary increase by at least 3-5% or more, depending on the industry. If you don’t mind approaching your boss about a raise, good for you; however, if you’re finding it’s hard to approach them, it may be a sign they are avoiding you on purpose. A good boss will be more than willing to at least sit down with you and explain why things are the way they are. It’s never a good sign if your fellow co-workers are leaving left and right. If your company has a high turnover rate, this is a pretty good sign that the employees either find a higher wage elsewhere or the company atmosphere isn’t good. A good company will have a positive workplace culture, a very low turnover rate and higher-than-average annual raises. Recruiters spend all day looking at resumes, conducting interviews and discussing salary information. It’s their job to take your strengths and sell it to the company if they feel you’d be a great fit. When you have the time, talk with a recruiter in your industry to see what kind of jobs you could potentially get, and it’s also a good time to discuss what you may be paid. Remember, these recruiters have seen 100s, if not 1000s of job postings and resumes, so they will have a good idea of what you should be paid. Salary.com has a great salary calculator that can help you figure out what you may be worth. This website aggregates data from employees and employers, and it will show you a salary range you should be within. However, this should be a starting point because these calculators often don’t factor in your experience, education and your responsibilities in detail. Haven’t had a raise in more than two years? If you’re working an entry-level position or even a senior position, it’s hard to keep working for the same pay year after year. Even if you accepted a salary at a low rate, you have to understand future employers will ask what you are being paid, and since you will tell them, they are going to offer a salary similar to yours. This is why it’s so important to make sure your salary glides along with your experience level because if not, you’re going to be hurting in the future. Being underpaid at work can be so discouraging, but it doesn’t have to be the end of your career. If you’re using the tips above and finding out why you’re being underpaid or not getting paid enough, take initiative because a boss won’t come to you out of the blue and give you 20% more. If your boss won’t side with you, then it may be time to start looking for a new job. This is a guest post written by Stephanie Lynch. She is a freelance writer who co-founded Howmuchisit. She currently resides in Gilbert, Arizona, with her two sons and husband.